Learning about wet-shaving concepts and techniques doesn't have to be hard or take countless hours researching online. Razor Emporium is committed to educating and empowering new and experienced shavers with essential information that will make this hobby more enjoyable. If you’ve never used a vintage razor and shaving brush, you may be unfamiliar with how to get started. Worry not, it’s easier than you think. Wash up. Start by rinsing your face with water. Water is what makes this “wet” shaving; providing hydration to your beard is key to a good shave. Most people enjoy warm water to open pores and soften the hair. Create your lather. Using your shaving brush, mix water and shaving soap or cream together to create a lather. The important trick here is to make a hydrated lather that is not too runny or dry. Work the brush and soap vigorously into your beard using circular motions, avoiding a “painting” stroke. The job of a brush is to not simply apply, but to build the shaving lather into and around your hair follicles. Start Shaving. Whether you’re using a safety razor or a straight razor, the two most important factors are angle and pressure. With a vintage razor, there is no flexible head that contours to your face; you must find the right shaving angle (usually between 20-30 degrees). The other variable to keep in mind is pressure. Because most of us have formed bad habits from modern cartridge razors, you must keep in mind that the weight of the razor does the work. In addition, lathering up several times and completing “passes” across your beard will get it the smoothest. Using with-the-grain,across-the-grain and against-the-grain strokes, you can achieve a close shave while minimizing irritation. Clean Up. It’s that simple! When you’re done shaving, rinse your face with cool water to help close pores and sooth your skin. At this point, apply either a shaving balm, after shave, or lotion to your face to help your face recover from the exfoliation the razor edge provides. If you’re prone to dry skin, avoid products that contain alcohol, as this can worsen the situation. Understanding the condition of vintage razors has never been easier. We've created a 5 tiered rating guide that should cover just about any safety or straight razor you come across. Original and un-opened packaging as it was manufactured The condition of the razor itself is not in question- in fact sometimes aging has damaged the razor inside of the packaging, yet it still remains un-opened. Appears as though it just left the factory floor Packaging has been opened but all items are in perfect condition All price tags, instructions, blades, shippers and boxes should be present. Some packaging materials missing No flaws to the plating or paint- no scratches or marks. Slight blemishes present Some missing paint or small scratches. Moderate damage or wear present Mechanically sound, aesthetically flawed. The resurgence of wet-shaving in today’s high-tech world may leave a few people scratching their heads and asking, “What exactly is wet-shaving?” Wet-shaving is simply the term used to describe using water, a shaving soap or cream, a shaving brush, and a razor to shave. It’s the opposite of electric shaving. Why use vintage shaving items to wet-shave? For most of us already in the modern wet-shaving community, using adouble-edge (DE) or single-edge (SE) safety razor is a requirement. There are also those who prefer to turn back the clock even further and use a straight-edge razor. But why use vintage? First, let’s talk about razors. Vintage razors offer something that today’s disposable razors can’t give: quality, craftsmanship and a connection with the past. When you hold a hefty metal safety razor, or fold open a vintage straight razor, there is no question that you are now in the driver’s seat to your shaving experience. These razors were made to last more than a lifetime, created out of heavy metals, plated in nickle or gold, or forged and shaped into existence. And besides the “cool” factor that comes with using vintage razors, using a single blade edge (as opposed to a multi-bladeshaving system) can help out dramatically with prevention of ingrown hairs, shaving irritation, and nicks. Next comes the shaving brush. The pleasure of using a warm brush to build a comforting lather on your face is a far more enjoyable experience than smearing shaving gel out of a can across your beard. A great shaving brush allows the user to do three things: create a lather that is balanced in water/soap ratio, gently exfoliate the skin, and work the shaving lather into and around the hair follicles on your face. Most people notice an improved complexion and less irritation after incorporating a well made badger, boar or synthetic brush into their shaving routine. The last element in the wet-shaving process is a well-made shaving soap or cream. The differences are really personal preference, so I suggest trying both. Either way you go, by creating your own lather you avoid the drying chemicals and propellants found in most canned shaving gel or foam. The lather created with your own brush and soap hydrates your skin, and adds to the general benefits of wet-shaving for your beard and complexion. Are vintage safety and straight razors sanitary and safe to use? The short answer is “yes.” If you find one that looks like it hasn’t been cleaned up and restored yet, its best to use some dish-soap, warm water, and plenty of elbow grease with an old toothbrush to clean around the surfaces. When you’re done, pour a little rubbing alcohol on it for good measure. That’s it- now the razor metal is cleaner than most surfaces in a kitchen! When you purchase razors from our site, rest assured that besides these precautions, we also put all shavers through an ultra-sonic cleaner and Barbasol before arriving to you. 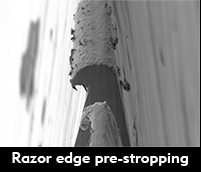 These extra measures makes our razors practically as clean and sterile as surgical instruments. What do I need to start this vintage wet-shaving hobby? With these three things, you can get started today with vintage wet-shaving. Sure there are more accessories and elements to “going vintage” than this, but they come with time. How do I strop a straight razor? Latigo leather comes from cowhide and has gained much popularity in the razor community lately. The tanning process involves both chemical and vegetable ingredients which yields a very pliable and supple leather. It is tumbled with natural fats and oils and thus builds up a waxy-like feel. The grain pattern on Latigo is broad and large so selecting flat sections to cut strops out of is crucial. When used in Strops, Latigo provides a high amount of draw- valuable feedback when perfecting your stropping technique. Care for with a cotton cloth and neatsfoot oil semi-annually. Natural Horsehide comes from the sides of horses and has been the stropping material of choice for over 100 years. It is vegetable tanned and lightly tumbled, yielding a soft and supple feel without a waxy texture.